A one-day hands-on seminar you won’t want to miss. 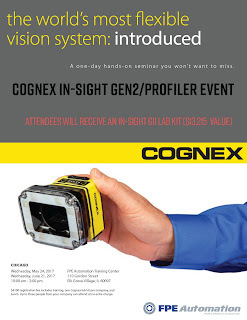 $4500 registration fee includes training, one Cognex lab kit per company, and lunch. Up to three people from your company can attend at no extra charge. In a continuing effort to expand the Optimax® product line, PHD is pleased to release the new drop-in replacement compact rotary table. Series ORQ Compact Rotary Table is a double rack and pinion system with increased output torque that eliminates backlash at the end of rotation. 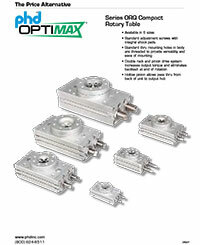 Download/view the PHD Optimax Series ORQ Compact Rotary Table brochure. PiGRIP is in the news! Here are a couple of images from a segment on 60 Minutes that originally aired on Sunday, April 9, 2017. 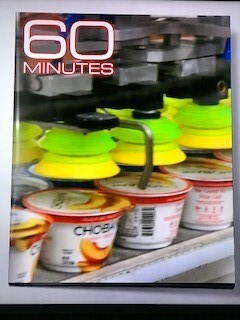 It featured Chobani yogurt at various stages during the manufacturing process. In a couple of scenes, Piab cups were very prominently featured. FPE Automation is one of Piab's premier distributors. It's an award-winning partnership that has lasted for decades. We're very proud of their success. 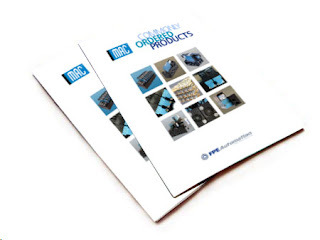 I (Sandia) worked with a team of experts* here at FPE Automation to develop a brand new, updated catalog. We've made it even easier to spec and order MAC Valves and several other related products. Check it out! Download/view the FPE Automation MAC Valves Commonly Ordered Products Catalog. *Sometimes, It takes a team effort! This 45+ page catalog has been a work in progress for some time now and we're thrilled to launch this latest edition. I'd like to thank Scott Massie, Joey Bardos and Ed Nowak, along with very helpful assists from Dave Bardos, Dan McCullough and Darryl Onak.